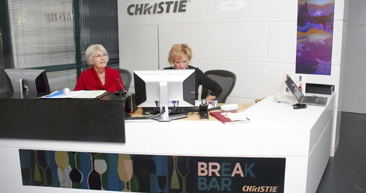 Christie is a true pioneer in regard to developing visual solution technology. The company has introduced many new products that raised the standard within the professional audio/video industry, resulting in award-winning technical novelties. Christie employs more than 1,000 people worldwide. Assembly facilities are located in Cypress; California, USA (Christie’s international head office); and in Kitchener, Ontario, Canada. Further international offices are located in Beijing, Shanghai, Singapore and Japan. Christie’s EMEA head office is based in Wokingham, Berkshire, UK. As the products of Christie are of an exceptionally high level, the company wanted to reach the same high standard when the time came to refurbish Christie’s EMEA head office in the United Kingdom. 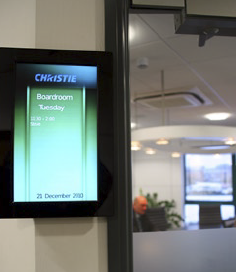 Not only that, the company wanted to demonstrate instantly the eye-catching added value of their award-winning Christie MicroTiles® to all visitors of the EMEA Head Office. A visually attractive wayfinding and visitor information system using MicroTiles needed to play a central role in the new look and feel of the building. The grand finale would have to be a showcase room that would not only be a digital feast for the visitors’ eyes, but also a mind-blowing demonstration platform that could convince them of the nearly unlimited usage potential of the MicroTiles. For Christie’s management, it was clear that there was only one software solution that could live up to their high demands. Christie chose Scala Services to manage the whole installation project and to supply Scala software to drive and manage their flagship installations within the head office by using Scala’s Content Management and Playback solution. When entering the reception area at Christie’s EMEA head office, visitors are greeted by a horizontal array of five MicroTiles, displaying various welcome messages and brand elements that will surely catch their eye. These tiles are embedded in the reception desk, and their visual impact is complemented by a vertical array of tiles that has wayfinding and branding information. All potential clients that will be looking for a corporate communications or information channel solution will be truly impressed by this set-up. Once signed in, the eyes of potential clients will immediately be drawn to the visual set-up at the back of the waiting area. There, a rear projection screen plays live news information from a Christie HD6K-M projector. On each side of that screen, a 2×4 tile vertical pillar is situated. This completes the visual experience, as the pillars play ambient, eye-catching visuals. The integration of live feeds into digital signage projects is a very interesting and powerful feature, as it offers a clear value to the viewers. And live news, weather, stock exchange or local event information ties the audience’s attention to the screens and makes spectators more receptive to other messages such as promotional content or third-party advertising. After the waiting area, the Christie Trophy Room awaits the head office visitors. On two Scala-driven vertical arrays of 1×2 MicroTiles, multiple distinctions and award-winning projects scooped by Christie are displayed. In the main showcase area, Christie has installed an 80-tile video wall array in which Scala content can be shown via Christie’s Spyder X20 video processor. That content can be presented in any array or simply as one of many input sources. 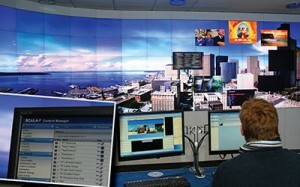 The Christie Vista Spyder solution gives a control room manager total control and flexibility regarding the screens he manages. He can mix an incredible number of sources in multiple windows, create all kinds of Picture-in-Pictures (PIPs), define, shape and blend borders with remarkable ease, and do it all without a hitch every single time. 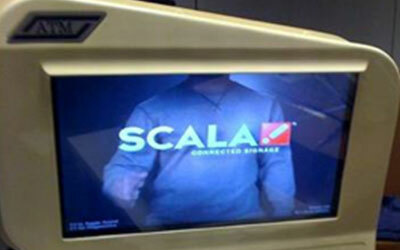 In addition to the MicroTiles, Scala Services also supplied and installed four IAdea photo frames. 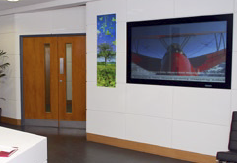 These displays are installed outside all meeting rooms within the building. Connected to the Scala Content Manager, they display real-time information about room availability, as well as corporate brand messages. 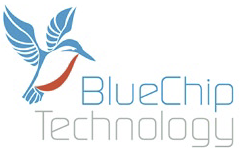 Scala Services selected the Blue Chip Vario E2 media Player to drive the displays. This hardware was selected in order to comply with Christie’s high-level requirement regarding resolution quality for its MicroTiles. The Blue Chip Vario E2 ensures top level graphics quality and playback performance and was therefore the preferred choice for the Christie MicroTiles showcase. Blue Chip Vario E2 units drive the range of displays at the Christie Head Office and are installed in the communications room in a professional rack system for easy access and maintenance.